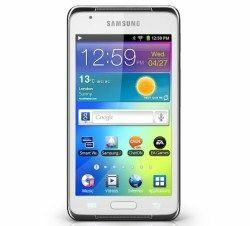 MWC: Samsung Galaxy S WiFi 4.2 takes on Apple iPod Touch | What Hi-Fi? The Samsung Galaxy S WiFi 4.2 has been launched at Mobile World Congress here in Barcelona. The focus at Samsung's stand may be on the Galaxy Note and Galaxy Tablet products - and the projector smartphone, the Galaxy Beam - but the Galaxy S WiFi 4.2 should have plenty of appeal. It draws on the Galaxy S smartphones for design and styling, measuring just 8.9mm thin and weighing only 118g. A portable media player not a smartphone, it has a 4.2in, 800 x 480 IPS TFT screen, is running Android 2.3 OS (Gingerbread) and sports a 1GHz processor. It supports the normal spread of sound and video formats and codecs, from AAC, FLAC, MP3 and WAV, to DivX, MKV, MP4 and WMV. The Android OS brings web browsing and access to Samsung Apps - as well as the Android Market of apps - and the Samsung Hubs content platforms. There's a 2MP rear camera and a VGA camera on the front for making video calls with Skype, for example. Pushed as a gaming device, too, it comes preloaded with EA Games' FIFA 2012 and Need for Speed Hot Pursuit and has an integrated gyroscope for motion controlled gaming. Samsung's DLNA platform, All Share, is on board too, as is wireless media syncing using Samsung Kies and remote control of your Samsung TV using SmartView. It comes with Bluetooth 3.0 capabilitity and of course WiFi, plus Samsung's SoundAlive audio processing and a built-in stereo speaker. The Samsung Galaxy S WiFi 4.2 will be available in 8 and 16GB incarnations, plus there's an SD card slot for expanding the storage capacity further, and is due out later in Q2 this year.